Catch Wayne on the OWN Super Soul Sunday November 27th, 2011! Nourish your mind, body and spirit every Sunday on OWN: The Oprah Winfrey Network. Each week from 8-11 a.m. ET/PT, Oprah Winfrey presents a special three-hour block of programming called “Super Soul Sunday,” designed to help viewers awaken their best selves and discover a deeper connection to the world around them. Exploring topics including spirituality, the afterlife, alternative health, happiness and personal fulfillment, “Super Soul Sunday” will present fresh and thoughtful insights into what it means to truly live your best life. This Sunday, November 27th, 2011, leading spiritual teachers share their greatest lessons in a “Super Soul Marathon” of compelling interviews with Oprah Winfrey. 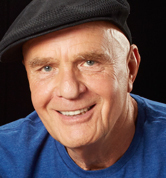 First, Wayne Dyer reveals powerful insights from Lao Tzu’s Tao te Ching. Dyer encourages spiritual seekers along their life’s journey, teaching the principles of peace, gratitude, and contentment. Click HERE for more information about “Super Soul Sunday” on OWN: The Oprah Winfrey Network.